Holy Cross Church, Chiseldon from the north. Chiseldon is a village in the borough of Swindon, Wiltshire, United Kingdom. Pop. c. 3000. The village lies on the edge of the Marlborough Downs, a mile south of junction 15 of the M4 motorway, on the A346 between Swindon and Marlborough. The hamlets of Draycot Foliat, Hodson and Badbury are nearby, and the village of Wroughton is around two miles to the west. Chiseldon Primary School is located in the village and has some 300 Pupils, most of them from the village itself. 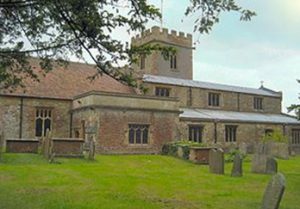 The Holy Cross Church is also located in Chiseldon. The Church, built in the thirteenth century is currently run by the Reverend Roger Powell as are the Churches in Ogbourne St. George and Ogbourne St. Andrew. The village also has a surgery, as well as two Hotels, an ESSO Petrol Station, and various other businesses. The engineering consultancy firm Halcrow Group Ltd operates from Burderop Park, located in the parish.